What is the Best Way to Protect Hardwood Floors? You love your sofa, tables, and chairs, but they sure can be rough on your gorgeous hardwood. Scratches and gouges from moving furniture are unsightly and cause permanent damage to your expensive home investments. But your floors and furnishings live in harmony by using hardwood floor protectors. The fastest and most effective felt pads on the market are self-adhesive felt furniture pads. The biggest knock against felts is that they aren’t sticky enough but that’s because most people get the cheap kind. Choose dense felt pads with a strong adhesive and you can’t go wrong. 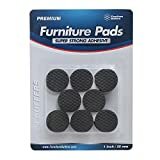 The Furniture Buffers line of protection pads for hard surfaces provide the ultimate buffer between your beautiful, expensive floor and the cold, cruel scrapers that are chair and table legs. They’re literally backed by the strongest adhesive on the market. They’re made with ultra-compact, super dense felt. 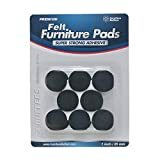 The padding is super soft and even tabbed “medium glide” because, although they’re not sliders, you can slide your furniture with them gently and safely. Unlike nail-ons, they will not damage surfaces or furnishings. Lifetime guarantee! If you ever have a problem, they’ll replace or refund your purchase if you have any problems. There are two products to consider. The 24 pack of small felt furniture pads is perfect for smaller projects and cover most standard chair and table legs with a 1 inch circle. Moreover, you don’t have to worry about them sticking out like a sore thumb – they’re black and sleek so nobody will even see them underneath your chair and table legs. For bigger and more diverse protection projects, including heavy furniture and larger or smaller legs, The Jumbo Pack includes several 1 inch felt pads along with an assortment of small, medium, and large pre-cut pads. There are even 2 large rectangle sheets for making your own custom cuts. These contain the same smooth, dense black felt that will protect your hardwood floors without detracting from the beauty of your furnishings. The added benefit to purchasing the Jumbo Pack is you get a huge variety to cover every size of table or chair leg possible along with even more standard 1 inch pads. The Jumbo Pack is the best value on the market because it covers everything. One of these will have most households set for life! These peel-and-stick protectors are easy to apply and will keep your floors smooth and undented even in areas with heavy use. Read more on why Furniture Buffers felt pads are the best. As always, make sure to follow the directions before applying so you can ensure they remain at optimal stickiness! For more products and info, visit the Furniture Buffers Facebook page.